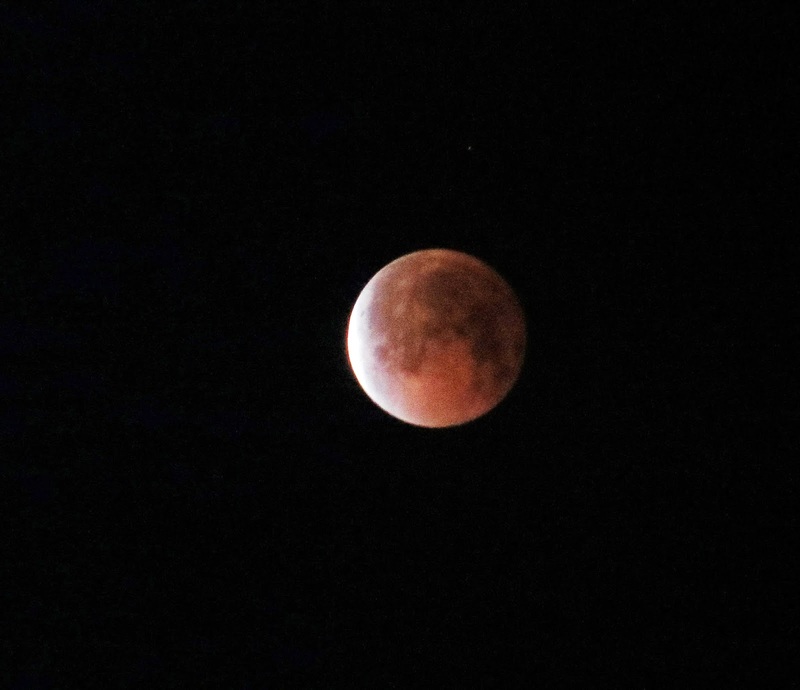 When I learned that there would be a "Blood Moon" -- actually an eclipse of the moon by the earth's shadow, not becoming completely dark as light bending around the earth and through the atmosphere would give it a reddish color -- I wanted to see and photograph it. But the eclipse was to occur in the very early morning hours, around 4:00 AM. Any photograph I would take with the 20x zoom lens on my little digital, without a tripod, would render it hopelessly unprofessional, so what's the sense I wondered. Having planted the seed of getting up at that time to experience the eclipse, I thought I'd get the camera ready just in case I was actually awake. Hopelessly neurotic though, I knew if I did that, I'd probably be up at 2.00 AM waiting, so my decision was just to go to sleep as usual, set no alarm, and enjoy the professional photos I'd see online. Nonetheless, being but a mere slave to an unforgiving body clock I woke up at precisely 4.00 AM. Now I had to find my camera, hope the battery was still sufficiently charged (it was), and would be able to get something meaningful with my hand-held. I opened the door to our home's courtyard in the still of the night and beheld the sight of the blood moon. Impossible to photograph at 20x zoom just standing there, so I took a chair from the area near our pool and sat down and propped my elbow, an improvised tripod. Still the "target" jumped around on the camera's little LCD screen, trying to lock in the focus. However, the best part of sitting there was being in the moment, putting down my camera from time to time just to take in the sweeping quiet of the night, not a breath of wind, no sound whatsoever. Just the Blood Moon, Mars, and the stars and myself looking at the spectacle. After a while I thought I identified a faint sound, a steady almost imperceptible humming. It wasn't traffic far off on I95 or the Florida Turnpike -- too early given its continuous nature. It was the electricity running through the wires and transformers on the street, the only man-made sound, not noticeable above the normal din of day. Although there are much better photos of the event almost anyplace one searches, I offer up a couple of mine as they are my own record as posted in this modest blog. I particularly like the one of the moon and mars (to the far right, a little red dot), as it defines our insignificance in relation to the cosmos. And I'll add this blog to that definition, just a kaleidoscopic record of one person's late-life journey. I've been writing this, now, for some six and a half years and this entry marks my 400th. If one searches "blogging" or "writing" among the labels to the left, there is plenty of content as to why I try to keep this up. It all stems from the title of the blog, the essence of the word, "lacuna."